In the mood for a Moroccan dish this week? If so, you can’t get more authentic than lamb tagine, which originates with the country’s first inhabitants, the Berbers. Today’s lamb tagine recipes show the influence of later inhabitants of the land, including spices and dried fruit from the Arab culture, and olives and olive oils from the Moors. For a completely authentic twist, serve this large, hearty meal at lunch instead of dinner, which is the biggest meal in most Moroccan households. Combine the cayenne, black pepper, paprika, ginger, turmeric and cinnamon into a small bowl. Place the lamb in a large bowl and toss together with half of the spice mix. Cover, place in fridge, and leave overnight. Heat 1 tbsp olive oil and 1 tbsp argan oil in a large casserole dish. Add the grated onion and the remaining spice mix and cook over low heat for 10 minutes, or until the the onions are soft but not coloured. Add the crushed garlic for the last three minutes. In a separate frying pan, heat the remaining oil and brown the lamb chunks on all sides. Add the browned meat to the casserole dish. De-glaze the frying pan with ¼ pint of tomato juice, and add juices to the casserole dish. Add the remaining tomato juice, chopped tomatoes, apricots, dates, raisins or sultanas, flaked almonds, saffron, lamb stock and honey. Bring to a boil, cover with a fitted lid, place in the oven and cook for 2-2½ hours or until the meat is tender. 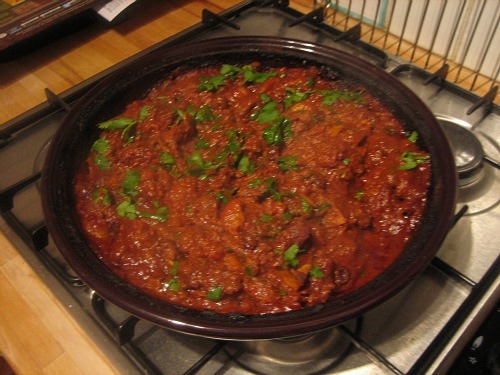 Place lamb in a tagine or large serving dish and sprinkle with the chopped herbs. Posted on October 19, 2014 by Ace Worldwide News Group	• This entry was posted in Ace Food & Health News and tagged #AceFoodNews, Lamb, Spices, Tagine. Bookmark the permalink.